27 Oct 2017 / 22:22 H.
KUALA LUMPUR: Prime Minister Datuk Seri Najib Abdul Razak today announced additional flexibility for the National Higher Education Fund Corporation (PTPTN) loans. He said for students from B40 households (earning below RM3,855) undergoing highly marketable courses, an additional RM200 million would be provided to increase the maximum loan amount. "The grace period for loan repayment is now extended to 12 months upon completion of study compared twith six months currently. "For borrowers intending to pursue their studies to a higher level, for example from diploma to undergraduate, they may combine both loans into a single loan and to repay upon completion of their studies," said Najib, who is also Finance Minister, when tabling Budget 2018 in Parliament here. He said the government had also agreed to extend the discount for repayment of PTPTN loans until Dec 31, 2018 as follows; 20 per cent on the outstanding debt for full settlement; 10% for repayments of at least 50 per cent of the outstanding debt made in a single payment; and 10% for repayment through salary deductions or scheduled direct debit. 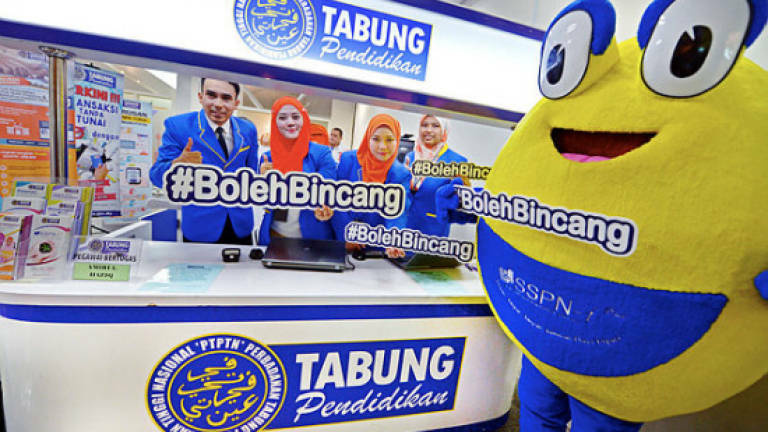 In the budget speech themed "Prospering An Inclusive Economy, Balancing Between Worldly and Hereafter, For The Wellbeing of Rakyat, Towards The TN50 Aspiration", Najib also announced an allocation of RM250 million to 500,000 contributors aged seven to 12 years under the National Education Savings Scheme (SSPN-i Plus) which was rebranded as 1Malaysia Education Savings Scheme (SSP1M) managed by PTPTN. Najib said a matching grant of RM500 would also be provided to contributors with a total contribution of at least RM500 and could only be withdrawn upon attaining the age of 18 years. In addition, he said individuals income tax relief for net savings in the SSP1M up to RM6,000 be extended for another three years, effective from year of assessment 2018. Meanwhile, he said the was also aware about the importance of transformation in the Technical and Vocational Education Training (TVET) in producing highly skilled and competitive workforce. "In this regard, all TVET institutions under seven ministries have been merged and known as 'TVET Malaysia' under the purview of the Human Resources Ministry. "A sum of RM4.9 billion is allocated to implement TVET Malaysia Masterplan," he said. To encourage TVET graduates to pursue their studies, the prime minister said the government would also provide 100 TVET Outstanding Student Scholarships with an allocation of RM4.5 million. He explained that in order to support the development of skilled workers in the rail sector, the government would establish the National Rail Centre of Excellence to oversee and coordinate quality assurance as well as accreditation of national rail education and training.